As a gift to all of you who have waited so patiently, I break my rule of not sharing a book before I’ve completed it: here is the (current) beginning of Owen Archer #11. I hope you enjoy it, and may the new year bring you joy, wonder, and peace. The river mist curled round Magda Digby’s rock in the Ouse, dimming the reds and golds of sunset, distorting sound, creating shifting shapes that danced at the edge of Alisoun Ffulford’s vision, chilling her fingers until they were too stiff for the close work. She gathered up the feathers, arrow shafts, and knife with which she had been fletching and returned them to her work basket. She paused with her hand on the door latch, listening to dogs baying. Upriver, she thought, in the Forest of Galtres. “May they be safe,” she whispered. Like St. Francis of Assisi, she felt a bond with animals, so much so that Magda handed over to her all animals brought to the house on the rock for healing. Alisoun preferred these patients to the human ones. Their needs were clear, they did not try to mask their illnesses, and, once healed, gladly departed without complaint or blame. She strained to hear the sounds beneath the dogs’ baying. A man’s angry shout. Another. The same? She could not be certain. The dogs continued as before, which she took to mean they were unharmed. Good. She lifted her gaze to the blank eyes of the upside-down sea serpent on the bow of the ship that served as the roof of Magda Digby’s house. A cunning choice of building material, the part of the ship with the figurehead. The sea serpent was widely believed to have magical powers. Not that Magda ever confirmed or denied it, but as folk had the same suspicion about her, their unease about the sea serpent and the Riverwoman gave them pause about crossing either one. Nodding to the enigmatic carving, Alisoun whispered, “Whoever trespassed upriver will think again.” A subtle draft and a warmth on the back of her neck, as if the figurehead responded in a gesture of reassurance, felt rather than seen. There had been a time when it had frightened her, but that had passed as she learned to trust to the mystery of Magda Digby’s healing gifts. Now, she took it as a blessing. She steadied herself by calling to mind the remedies for dog bite and checking her supplies. Although Magda said folk knew to give guard dogs a wide berth, there was always a first time. Betony for the bite of a mad dog, pound in the mortar and lay on the wound. Or plantain. Vervain and yarrow to be mixed with wheat. Burdock and black horehound need salt. Calendula powder in warm water to drink. She had plenty betony and calendula powder. Though she was unlikely to need it, she was prepared. Now to her evening meal. The fragrance of the stew pleased her. She had learned to use herbs to season her cooking, making almost anything palatable, even a coney that some would have rejected as too old and gristly for the stew pot. With Magda away, Alisoun felt obliged to stay close to the small rock island in the tidal river, so that she might not miss those who came to the Riverwoman’s house for healing. She dare not range too far afield in hunting for food, making do with fish and small prey like the aged coney that had appeared on the riverbank nearby. She paused with her spoon halfway to her mouth as a lone dog began to bark, an angry sound, and then a man’s startled shout, followed by a loud curse, a few more cries, more pain than anger. Then silence. Alisoun lowered her spoon, bowed her head, and pressed her shaking hands together in prayer. She stayed there until she felt the tremors quiet. Though Magda scoffed at prayer, she encouraged Alisoun to use her apprenticeship to develop her own skills as healer, not become a second Magda. All that goes before shapes thee. Even thy habit of prayer. Magda honors that. 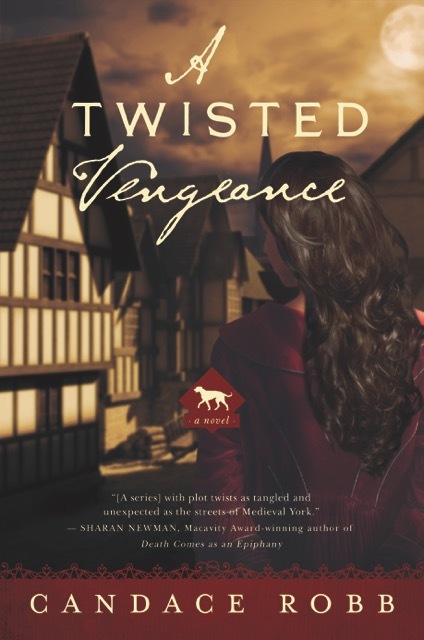 Alisoun had little faith that her prayers were heard—God and the Blessed Mother had stood aside while she lost all her family to the pestilence. But something in the words, the ritual, comforted her. As it did now. According to Magda, to pay attention to how Alisoun felt about her choices was to heed her inner wisdom, whence came her gift for healing. It was a miracle that Magda had taken her on as an apprentice. In Alisoun’s grief as she watched her family die of the pestilence, she had blamed the Riverwoman for her mother’s death, and demanded that the healer make amends by teaching her all she knew. Magda had given Alisoun shelter for a time, let her observe as she might, and then sent her away to serve as a nurse for Captain Archer and Lucie Wilton’s children, and as a companion to successive invalids. Praying that they were tests, Alisoun had done as she was told—though not without frequent complaint. And though Magda had warned her time and again Thou hast fire in thy eyes, and it is blinding thee, she continued to invite Alisoun to observe her, and, in time, to attend her. 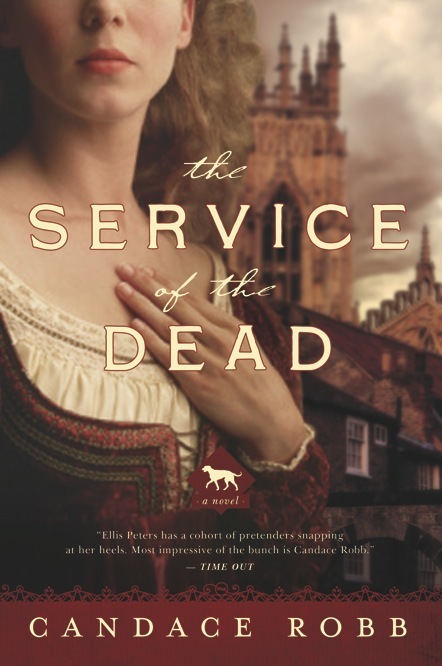 The turning point had come at the deathbed of Archbishop Thoresby, where Alisoun had served as the Riverwoman’s assistant. From that time forward, Magda referred to Alisoun as her apprentice—and sometimes simply as a healer. Too much thinking. She finished her modest meal and tidied up, then settled on a stool by the fire and tried to empty her mind, listening to the fire snap, the house creak as it settled for the night, the drying herbs rustle above in the draft from the unglazed windows. With the tide out, the sounds of the river receded to a soft gurgle. Until this evening she had welcomed this part of her day. But the solitude wore thin. She missed Magda and looked forward to her return. The Riverwoman had accompanied Lucie Wilton and her family to her late father’s manor to the south, Freythorpe Hadden. It was a somber traveling party, escorting the body of Philippa, Dame Lucie’s aunt, for burial. The elderly woman had died in her sleep after a long decline, cared for all the while by Dame Lucie. Most fortunate woman. When Alisoun served as nursemaid in that household she had chafed under the old woman’s watchful eye, but in time she had grown fond of her. Dame Philippa loved to tell tales, and would hold Alisoun’s hand in both of hers as she reached the conclusion, leaning close and looking straight into her eyes. The tales had taught her so much about the important families in York that the city felt less foreign to her—having grown up on a farm upriver, it was a gift. So many gifts, so undeserving. Alisoun was roused from her reverie by the clatter and squelch of someone stumbling on the slippery rocks that led from the riverbank on the north to Magda’s rock in low tide. The earlier unease returned, and she fought the impulse to string her bow and ready an arrow as she rose to fetch a lantern. But Magda’s training steadied her. Those seeking a healer should be greeted with open arms, not an arrow aimed at their heart. In response to a firm rap on the door she swung it open, lifting the lantern high as she intoned, “All who seek healing are welcome here.” Magda need not bother with such greetings. Her mere presence reassured the supplicant. But Alisoun did not yet have that gift. A man stood on the porch, blocking the fading light. “I seek the Riverwoman.” Pain constricted his voice. He stood slumped, one arm cradled in the other. “I see you are injured. Dame Magda is away, but she has entrusted me with the care of those who come seeking her,” said Alisoun. Adjusting the lantern so that she might look at the arm he favored, she noticed him glancing up and bobbing his head at the figurehead, a ritual of respect she had seen before. 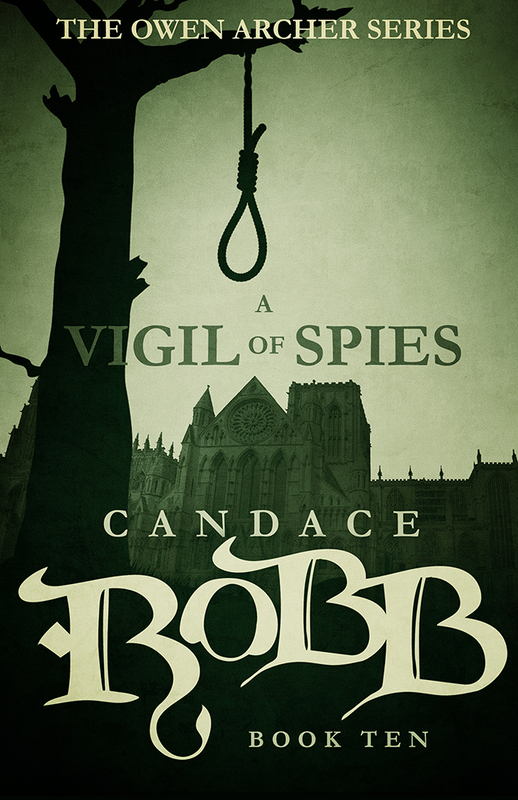 The injured man was Crispin Poole, a merchant recently returned to York, who had consulted Magda about the pain he suffered in his stump of an arm. Long healed, but still troubling him. Tonight he cradled it as it bled through the sleeve of his jacket. Saturated, she found when she touched it. She felt him trembling, smelled his sweat. “A knife wound?” she asked. Not quite. In winter a small pack came down from the moors, seeking food. They did not harm folk unless threatened. And it was not yet winter. Alisoun might reassure him of this, but Magda’s instruction was to say only what thou must. Thou art here to listen. She might say much to that, but she chose her words. “I have seen to a variety of wounds.” She stepped aside to allow him into the house if he so chose. He hesitated, then ducked beneath the lintel, and entered. As she closed the door Alisoun looked out into the gathering darkness, puzzled by the absence of a horse on the bank. Most who traveled through the forest rode if they had the means, and Crispin Poole was wealthy. Or so they said. So he had been on foot when attacked. Doing what? She imagined Magda standing before her, a bony finger to her lips, shaking her head. Thou art a healer, not a spy. Crispin had settled on his usual bench near the fire. That would not do. “Forgive me, I should have said—for this you must sit at the worktable.” She led him across the room, conscious of how he must hunch over to avoid the rafters and the hanging herbs. Tall like Captain Archer, yet otherwise so unlike him. “No. Of that I am certain. We locked eyes as we each backed away.” He shivered to describe it. The experience had unsettled this bear of a man. She wondered what he had done to so anger the dog for it to attack. And the earlier baying. Why did he deny what he must have heard? She reminded herself that a healer must put the good of the patient before her curiosity. He must not feel compromised. She took a deep breath. Enough talk. “Some brandywine before I clean it and stitch the flesh together? My ministrations will worsen the pain before relieving it, the worst of it.” And calm him, she thought. She needed him steady. Slipping away to pour him some, she also fetched warm water for the calendula drink. With such a deep wound, best to give him that now, and send him home with enough for a day, as well as packing the wound with a paste of betony. And boneset, in case the bone had been damaged. She sensed his intense eyes following her hands as she worked, but he kept steady and silent. Nary a jerk or a wince. He was accustomed to sudden, sharp pain. Well, the arm. Of course. It was only when Alisoun was tying the bandage that he spoke again. Alisoun felt her face grow warm and was glad only her hands were in the lamplight. Apparently she was too quick to recite her litany of females who had been treated as grown women by the age of sixteen. Crispin nodded. “And I would ask that you tell no one of this incident,” he said. “Not even Dame Magda.” He neither raised his voice nor seemed excited, yet he made it clear he expected her to agree. Something in his eyes. “I am confident that you will find a way. My efforts to impress the city merchants would be undercut by tales of such an incident. 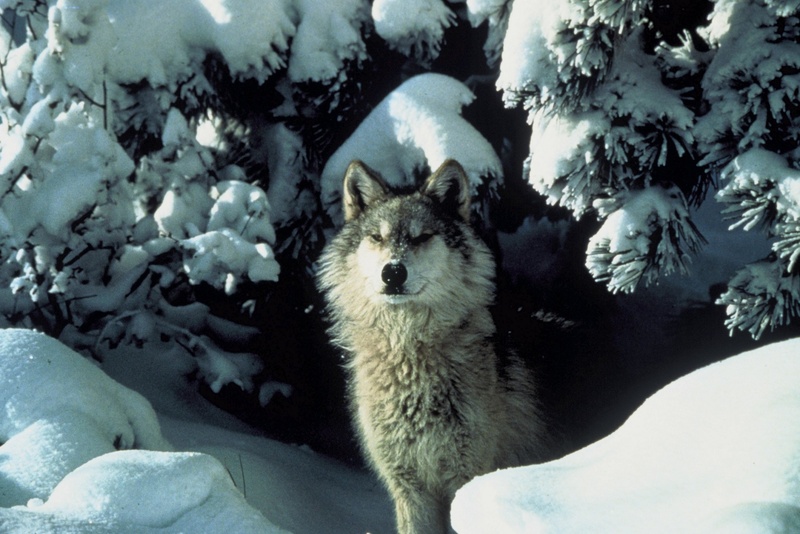 And I do not wish Dame Magda to know me for a fool who had challenged something so wild and powerful as a wolf.” A slight smile brightened his wide, dark, thickly lashed eyes. An interesting face, unscarred, yet with the uneven color and roughened texture of someone who spent much time at sea. His heft was characteristic of a muscular man going soft as he aged and grew less active. Magda had called him a merchant adventurer—though more the latter, suspecting he earned more of his wealth by eliminating his partners’ competition than by his eye for a bargain. For such a man to be so disquieted by an encounter with a dog, and now this secrecy—the weight with which he made that request belied his flimsy explanation. What had so shaken him? Secrecy added cost to treatment for those who could afford it—Magda’s rule, as it helped her see to those who had not the means to pay her. And, indeed, when Alisoun named her fee, Crispin did not object, drawing the silver from his scrip without comment. Hardly the pittance one might feel compelled to pay to avoid looking the fool. She handed him the pouch of calendula powder, with instructions. She stepped out the door after him, glad to see that she had worked quickly enough that the tide was just beginning to come in. Crispin bowed to her and set off across the rocks, his boots getting wet in the slowly rising water. I should think you will be safe… Why? Had someone set the dog on him? He’d said he’d been a fool to challenge it. Then why had he done so? And why had it not simply kept its distance as animals commonly did in such encounters? And his denial of the earlier baying. There was something more to this. As she lingered in the doorway staring at his back she caught a movement to her left. A figure stood at the edge of a stand of trees. Twenty, thirty paces up the riverbank. Watching Magda’s house? Or Crispin Poole? She thought to warn the injured man, but he had already reached the bank. She might wade across, but why? If he could not see to warning her away from danger, why should she bother? She had fulfilled her duty as a healer, tending his wound. Glancing back toward the stand of trees, Alisoun saw no one. “My imagination?” she asked the sea serpent. No response. Not a good sign. Once inside she strung her bow and set it near the door, with a quiver of arrows. The tide might be coming in, but she would take no chances. A week later, Alisoun woke shortly after dawn, having dreamt again of Crispin Poole being savaged by a hell-hound, a giant creature, black, with blazing eyes. Shivering, she stoked the fire, lit a lamp, and checked the young woman on the pallet by the fire, grateful for an absorbing task. Young Wren’s head was cool. God be thanked, the fever was gone. A simple miscarriage, nothing worse. And, for this serving girl, a blessing. A child would bring only grief. Gently shaking the girl awake, Alisoun helped her sit up so she might drink the honey water laced with herbs to stop the bleeding. “If I hurry, my mistress will never know I was gone the night,” said the girl in a hoarse whisper. Her throat was dry from the herbs that stopped the bleeding. The honey in warm water should help that. With Alisoun’s assistance, the girl swung her feet down and rose with nary a wobble, even taking a few hesitant steps. “Oh!” She lifted her skirt, saw the watery blood trickling down the inside of her short, fleshy legs. She should prefer that the girl lie abed for a day. This was the hardest part for Alisoun, keeping her counsel. Thy opinion is naught but interference, Magda would say. If thou wouldst care for her again, do what she asks and no more. She must allow the girl to return to the house where her master lay in wait, and he would continue to lie with her until she conceived a child and carried it long enough for his wife to discover her condition, tossing her out onto the street as a Magdalene. Unless the charm worked. Alisoun had whispered it over the girl as she slept, a charm said to render a man impotent when he touched her. Magda was not here to chide Alisoun for using it. Even so, she had shivered as she whispered the words, imagining Magda’s sharp eyes watching from afar. No one knew the extent of the Riverwoman’s powers. “Will you?” the girl repeated, tugging on Alisoun’s sleeve with the dimpled hand of a child. “This is not so strong that you cannot work as usual. You need not be in pain.” She pressed it into the girl’s hand. Once she had escorted the child safely through the ankle-deep water, Alisoun returned to the hut and sat down by the fire, drying the hem of her gown while planning her day. She should see Muriel Swann, make certain that the flutters she had felt days ago were indeed the child moving in her womb. Not a young woman, this was the first time Dame Muriel had carried a child long enough to feel it quicken, and the experience had both excited and frightened her. Alisoun added to her basket a calming potion for Muriel’s headaches, and a tisane to increase her appetite. A memory intruded. A dog in the night, and a man’s cries. Terror. Agony. The girl had awakened, calling out in fear, and Alisoun had risen to comfort her, assuring her it was just a bad dream. But it had been no dream. Had she been alone, Alisoun might have stepped outside, listening so that she might gauge whence came the cry, then set out at first light to see if she might be of help. But the girl was her first responsibility. Now she gathered the remedies she had administered to Crispin Poole a week earlier. As it was light, she might walk upriver, see whether she could find the injured man. She placed the basket with all she might need on the small chest by the door, then fetched her bow and a quiver of arrows. Poole had not returned, nor had she seen him or heard anything of him, and that silence, that absence made her uneasy. A soft rain in the night had freshened the late summer foliage in the meadows and woodland along the road from Freythorpe to York and tamped down the dust, for which Owen Archer was grateful. He knew the misery of riding for hours blinking away the dust in his one good eye, a scarf protecting his nose and mouth. For Lucie and the children, riding in the cart ahead of him, there was still the discomfort of a bumpy ride, but he heard no complaints. For a while they had traveled behind a group of players who serenaded them with songs and japes, a felicitous arrangement, though he hoped that his eight-year-old daughter Gwenllian would forget the bawdier lyrics. Now that the players had moved on, the monotonous rattle of the cart and horses was punctured now and then by sounds of reapers and gleaners in the fields, though not as many as on their journey to Freythorpe. Harvest was almost over. He enjoyed watching his wife Lucie with the little ones, admiring how gracefully she sat, back straight despite the jostling. At the moment Gwenllian leaned over her brother Hugh, her dark curls veiling her face and mingling with the five-year-old’s bright red hair. She was teaching him a string game. Lucie held Emma, the baby, guiding the two-year-old’s chubby fingers in the intricate patterns. Emma had a gurgling laugh that easily rose to infectious peals of laughter, resulting in a general jollity. Alfred, Owen’s former lieutenant in the archbishop’s household guard, sat in front handling the carthorse, his companion the children’s chatty nurse, Lena. Every now and then Alfred would nod and shrug, his way of keeping the peace while only half listening. A tactic Owen envied. But years of playing the archbishop’s spy had turned him into a deep listener. Pity. He could use a deaf ear while riding beside the talkative Geoffrey Chaucer. Yet he was certain his habit of listening had strengthened his marriage. Lucie smiled and laughed with the children now, but last night Owen had held her as she wept for her aunt, and all the years she had wasted blaming Philippa for her father’s decision to send her to a convent after her mother died. He had listened until she exhausted herself, then did his best to persuade her that her tender care of her aunt for the last years of her life more than made up for those long years needlessly estranged. But she had been inconsolable. Bless the children. They seemed the best balm for her spirits. “Lucie is strong,” said Geoffrey, trespassing into Owen’s reverie. It was churlish to resent Geoffrey’s presence, Owen knew that. He had hurried to Freythorpe Hadden upon arriving in York and hearing of Dame Philippa’s death. Geoffrey had been fond of her, and she of him. While biding with them in York after the archbishop’s death, Geoffrey had endeared himself to Lucie by keeping her ailing aunt entertained. Arm in arm, he and Philippa would stroll round St. Helen’s Square and down Stonegate, she telling him what she could remember of the people passing by—her memory came and went—he embellishing the bits with invented tales of their younger, secret exploits, inspiring much laughter. She could talk of nothing else when he was called back to London. Such a storyteller, he is! And wise. “Forgive my temper. It was good of you to come,” said Owen. Jasper, their foster son and Lucie’s apprentice, had been left in charge of the apothecary. By choice. He had been eager to prove he was capable of seeing to the business for a fortnight. “As I said,” Owen muttered. “That may be the least of my concerns.” Owen gestured toward two men on horseback approaching their small company. One wore a Benedictine habit, and rode with a familiar grace. Alfred had seen them as well, and slowed the cart. Owen rode up beside it. Upon Archbishop Thoresby’s death his secretary, Brother Michaelo, had found himself without a home, without a purpose. A Benedictine, he had left the Abbey of St. Mary’s in York during the incumbency of the reasonable Abbot Campion. Unfortunately, the current abbot, knowing of Michaelo’s penchant for handsome young men, and a long-ago attempt to poison the abbey infirmarian, refused to receive him back in the fold. An earlier plan to return home to Normandy and seek a place in a modest priory near his ancestral home had clearly been one Michaelo pursued with reluctance. The compassionate Jehannes, Archdeacon of York, had suggested the monk stay with him for a time, believing there must be work for a man of Brother Michaelo’s experience in the city. Jehannes had need of a secretary, though not sufficient to keep Michaelo regularly engaged. He hoped to find other clerics who might need some of the monk’s time. But Michaelo’s reputation preceded him, and so far clerics proved reluctant. The elderly Bartolf was far more likely to be riding south to consult with Magda Digby about one of his mysterious ailments, which, according to the Riverwoman, were merely signs of aging in a man who moved as little as possible and drank wine to the point of passing out every night. Though of sufficient status and wealth to hold the position of coroner, he dressed more like a laborer except on official occasions, his clothes ill-fitting as he shrank with age, his copious white hair kept somewhat under control by a felt hat crammed low over his forehead, his pale eyes peering out through a snowy, greasy thicket. Many a widow in York yearned to clean him up—he had once cut a fine figure, when his wife was alive, and many remembered him with fondness. Today, he looked as if his horse had dragged him much of the way. Owen dismounted. “Master Bartolf, Brother Michaelo, good day to you,” he called out as the riders drew up beside him. “Hoban?” Owen looked up at Michaelo. “I am nobody’s man at present,” Owen said. Lucie reached down to touch Bartolf’s head. “This man needs care. Perhaps it is best that you let Brother Michaelo explain what has happened while I see to that gash on your head, Bartolf.” He had blood caked on his cheek and in the hair over his left temple. She had already risen and was stepping from the cart with Geoffrey’s assistance. “Let me see to you while my husband speaks with Michaelo.” She nodded to Owen and drew the old man toward the back of the cart, where she kept a basket of supplies. Owen said a silent prayer of thanks for Lucie’s graceful intercession. Once Michaelo dismounted, Owen asked him how he came to be escorting Bartolf Swann. “Father, what has happened?” Gwenllian asked sleepily from the cart. “He was savaged by dogs?” Owen asked Michaelo, who had followed him. “Bartolf’s dogs?” Swann kept a brace of hounds at his property in Galtres. Indeed, he seemed half asleep already, propped against the trunk of the tree, eyes closed, his breathing rough but beginning to calm. 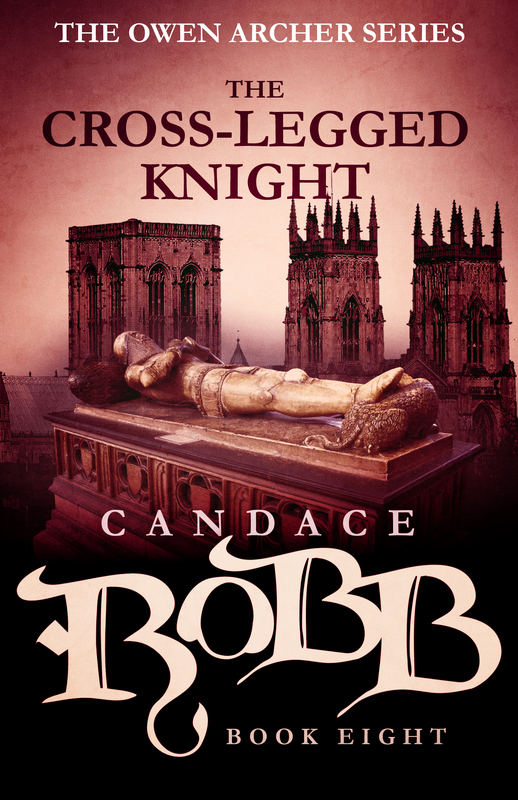 At long last, the 8th Owen Archer mystery, The Cross-Legged Knight, is out in e-book formats on 12 April! This was the one book not reissued in e-book and trade paperback in the US and Canada last summer because the rights were still held by the original publisher. But they’ve just reverted the rights back to me, and I gave Diversion Books the go-ahead to start the process of preparing it for publication in e-books (all platforms) and trade paperback. They amazed me by accomplishing the e-book conversion and cover design in the course of precisely ONE WEEK. An incredibly efficient team and a pleasure to work with. The trade paperback will be available shortly. As ever, this will likely show up on amazon first, then spread out to all e-book platforms by mid-week. 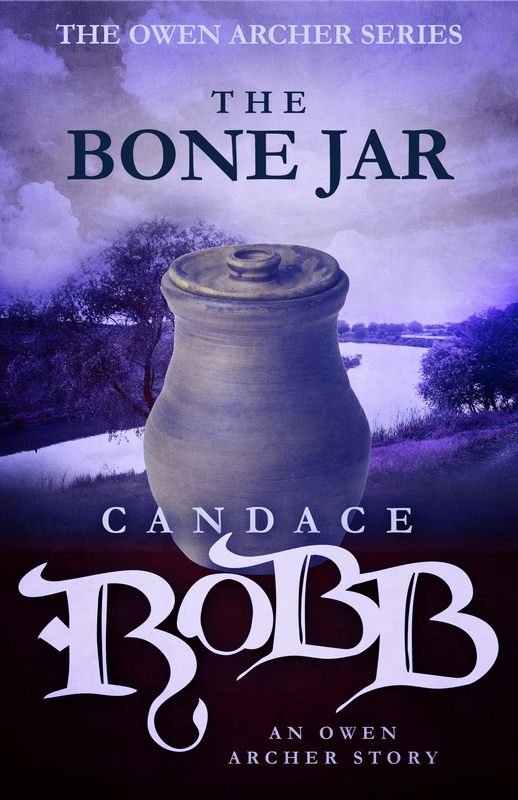 And, in case you missed it, last week we published an e-book version of an Owen Archer and Magda Digby short story, The Bone Jar. Chronologically it fits between The Nun’s Tale and The King’s Bishop, as Owen is awaiting the birth of his first child. I was invited to write it for an anthology marking the Nottingham Bouchercon, and it’s a joy to make it available to a wider audience. All English-language rights, so it should be available to all of you who read my books in English. And, soon, the debut of the Kate Clifford mysteries! Last week a friend with whom I’d lost contact called me, and as soon as I heard her voice, so familiar and welcome, the years fell away. We talked and talked, and my mood’s been buoyant ever since. We met 30 years ago in a three week residential writing workshop. We seemed such opposites, but maybe that’s what we so loved about each other. Over the years we’ve seen each other only occasionally, as we lived several states apart, and now even farther apart. L took a different career path, moving into photography, and now film making, but we still meet on common ground discussing our creative processes, and, of course, sharing our ups and downs, as women do. And we’re so proud of each other. I’ve also been working on a paper in honor of a good friend who’s been an enormous help to me with her expertise in 14th century fashion. I’ll be presenting it next week in a session in her honor during the Medieval Congress at Western Michigan University. For the paper I’ve reviewed 9 years of email correspondence plus her notes on my manuscripts—what a treat. What laughs! Again, a mutual admiration shines through. And there’s been a flurry of media chatter about female friendships because of the new cable series Girls—for instance, the NYT’s “The Spirit of Sisterhood Is in the Air and on the Air” (23 April). Serendipity. I’ve begun a novel about four women bonded together to solve a mystery—Lucie Wilton, Bess Merchet, Alisoun Ffulford and Magda Digby (working title, A Woman’s Worth). At the outset they don’t all consider themselves friends, though they’re all bonded to Lucie. And even there, the dynamic between Lucie and Alisoun has often been edgy, with Lucie as the employer and maternal figure against whose real and imagined criticisms Alisoun chafes. As I explore aspects of all four that haven’t been obvious or overt in earlier books—how they approach cooperation, what stories and aspects of themselves they expose to each other—their relationships will change and grow. By the end of the novel, I hope we’ll all see them differently, more clearly. I once sent Owen off to Wales to deepen his character by revealing more about his childhood and his current feelings regarding being a Welshman who’s spent his adult life in the service of the English king and an English archbishop, and married to a woman of English and French descent. Earlier in the series I’d revealed more about his martial past by reconnecting him with some of the men he’d led in battle. Lucie had her own revelatory crises while Owen was in Wales, but this, four women cooperating, this feels like the ultimate reveal-all for Lucie. And Bess, Alisoun and Magda. So what’s different about a woman’s behavior when she’s alone with her female friends? Thinking about my friendships, we don’t hesitate to stand up for each other, we’re proud of each others’ accomplishments, we’re honest when it’s clear our friend wants the truth, we laugh a lot, we’re comfortable with being silly, or with tears. The deeper our friendship, the blunter we trust we can be. But a lot of this can be true of friendships with men as well. It’s difficult to describe the difference, isn’t it? There’s an ease, a relaxation, a knowing. Still exploring this.